At the start of the week, Meghan Markle and Prince Harry announced their engagement, and yesterday she commenced her official duties as a future royal on a visit to Nottingham with Prince Harry. When the Duchess of Cambridge first began these visits, she caused British brands like L.K.Bennett and Reiss to have an astronomical boost in popularity, and now Meghan has aligned herself with two additional Brit brands. The American Suits actress wore a silk cotton chino skirt by British label Joseph with a navy coat by Mackage. Meghan's handbag collection is enviable, and yesterday she carried the much sought-after Nano tote by British label Strathberry in navy, cream and burgundy. Although the website says this style is currently sold out, it is restocking shortly. Meghan's style is classic and polished, but she often leans towards modernised shapes, as shown by her Joseph skirt and black ankle boots, which have a cone heel. Keep scrolling to see what Meghan wore for her first official visit, and shop the key pieces. 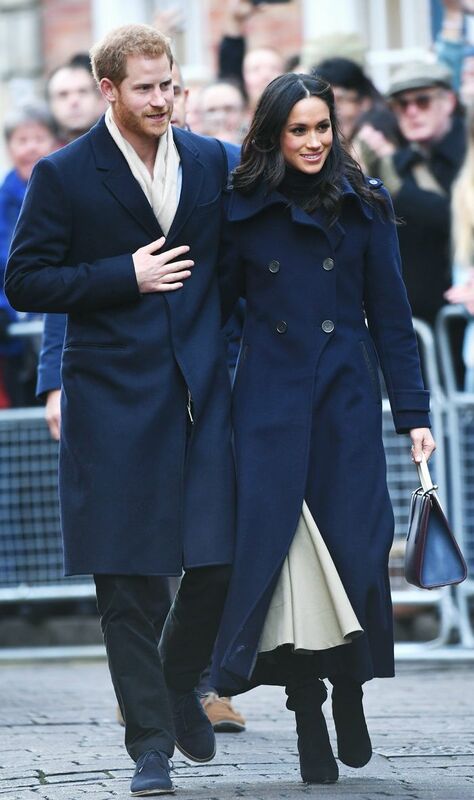 On Meghan Markle: Joseph Cotton Silk Laurel Skirt (£595); Strathberry Nano Tote (£295); Mackage Navy Blue Coat. Next up, see 11 ways to look as polished as Meghan Markle.